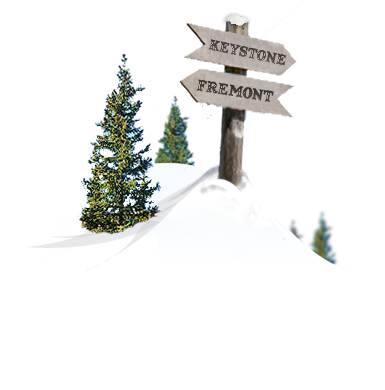 The Prospector is the ideal Keystone Snowmobiling Tour for double riders and is the only area snowmobile tour to provide child-sized snowmobiles free of charge! Our Prospector Keystone Snowmobiling Tours are ideal for individuals, groups and families seeking to explore a variety of snowmobile terrain in the presence of Colorado's most dramatic scenery. The Prospector Tour is our most popular option for families with children, first-time riders and adults who would prefer to "double up" and ride two people per machine. This two hour tour begins with a short meeting in which your guide will outline the operation of your snowmobile, followed by an open meadow practice session to become better acquainted with its handling. Guests then embark on a trail ride through spruce and lodge pole pine forests as they ascend towards the high alpine terrain of the Continental Divide. 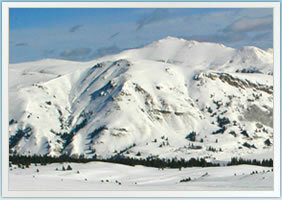 Upon reaching the tree line, you'll be treated to panoramic views of Colorado's two highest peaks - Mt. Elbert and Mt. Massive. Here you'll experience open bowl and meadow riding with opportunities to open up your snowmobile's throttle and make arcing turns across the surrounding mountainsides. Our free riding terrain also includes a meadow where children can try Keystone Snowmobiling for themselves, on child-sized machines located in a separate meadow. Children's snowmobiles are included free of charge. As tours descend from the Continental Divide, they stop by a historic miner's cabin, where guests can warm up with steamy cups of hot chocolate. Multiple departures are offered daily with tours starting at 9:00 am, 12:00 pm, and 3:00 pm. Complimentary transportation is available on all tours. 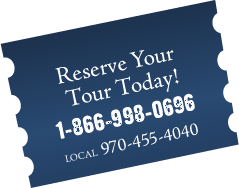 Pick-up times in Keystone are one hour and fifteen minutes prior to tour times. Snowmobile pick-up times in Silverthorne and Dillon are approximately 45 minutes prior to tour times. Transportation is available from the towns of Keystone, Silverthorne, Dillon, Vail, Beaver Creek, Breckenridge, Copper Mountain and Frisco, Colorado. To book your Keystone Snowmobiling Adventure at the Prospector Lodge contact us toll free at 1.866.998.0696 or locally at 970.455.4040. Snowmobile Tours are not recommended for children under the age of 4. 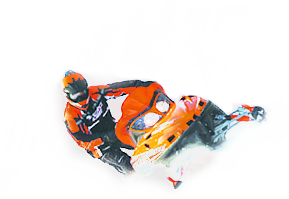 A credit card imprint, serving as a damage deposit, is required on all Keystone Snowmobile Tours. Snowmobile Drivers must be 15 years of age or older. The Prospector Tour may operate from slightly different base locations over the course of the winter season, dependent on where riding conditions are most optimal.